"Sir, as strange as it may seem to you at first blush, it is a fact that your wages will never be permanently increased until the hours of labor are reduced." I would like to open a can of worms and call into question the assumed divergence between environmentalism and consumerism. I am as guilty as anyone of promoting the idea that economic growth is bad or obsolete. But I have been reading extensively in the 19th century literature of the eight-hour movement. The first shock I got was discovering that "keeping up with the Joneses" was an Ira Steward invention. Steward was the author of first two sentences quoted before the jump. I've been reading Steward, George Gunton, their critics and defenders through the prism of a century's worth of disparagement of the "old, old fallacy that eight hours a day will mean more men to be employed." I'm beginning to realize that the opponents of the eight-hour movement not only suppressed an astonishingly advanced economic theory, they also usurped and defiled the accomplishments and the aspirations of the movement. This is not to say that Steward and Gunton got everything right but there is an immense amount to learn from their writings and legacy. Getting back to the argument about higher pay, at first glance it wouldn't seem to be in accord with the admonition of my friends in the Work Less Party to "work less, consume less, enjoy more." I propose that the solution to this riddle is that we don't need to consume less. We actually need to spend more. Our culture's unsustainable environmental footprint doesn't come from consuming "too much" but from consuming the wrong things -- cheap crap. Ironically, the reason we're consuming the wrong things is because wages are too low. WE CAN'T AFFORD the good life. What Juliet Schor identifies as "overspending" could better be viewed as throwing money away on disposable stuff because we don't have sufficient time or income to indulge in uplifting AND MUCH MORE EXPENSIVE social activities such as, say, taking five years off work to write a book, paint, sing in the opera, or play soccer. One of the things that struck me as I was comparing Cambridge Professor Alfred Marshall's writing to that of Boston mechanic, Ira Steward, is that the truly innovative thinking usually comes from outside the academy. An inordinate amount of the output of professional intellectuals consists of obscurantist rationalizations and repetition of the obsolete or the obvious. How many people would like to have the time and financial security to really develop their artistic talent, athletic ability or scholarly interest without it having to be a perilous and constricting career track? So I'm tempted to say, "Sir, as strange as it may seem to you at first blush, it is a fact that your way of life will never become environmentally sustainable until your wages are increased as a result of the hours of labor being reduced." So we begin to discover that the old, old fallacy has a bit of an identity crisis. Clearly Fetter's lump-of-labor notion was another name for Marshall's fixed Work Fund. The main advantage to Marshall's discussion of the fixed Work Fund is that it is a lengthy discussion that hints at -- even if it doesn't unequivocally state -- the identity of the object of its critique. A second advantage derives from Marshall's stature as an economist and as a pioneer of the formal university teaching of economics as a discipline. Who's idea was Marshall criticising, how well does that critique hold up and how consistent with Marshall's overall discussion was subsequent textbook lore about the lump-of-labor? Although the names Ira Steward and George Gunton don't appear in Marshall's chapter, it is clearly Steward's eight-hour theory that Marshall had in mind. Considering that Gunton's Wealth and Progress had been published four years earlier, it is more likely that Marshall was addressing the Gunton elaboration of Steward's theory. Whether he actually read Gunton (or Steward) or was merely reacting to second-hand accounts is not entirely clear from the discussion. In my estimation, Marshall's critique of Stewardism missed its mark. But it did so in ways that are instructive for the subsequent career of the lump of labor fallacy claim. In short, Marshall's fallacy claim is hemmed in by profuse qualification and the "putting aside" of circumstances that could readily be argued to be the central issue behind the reduction of working time -- namely, the longer term impacts of psychological fatigue on output. In other words, the way Marshall frames the argument leaves the fixed Work Fund (or lump of labor) claim vulnerable precisely to what Marshall's student, Sydney Chapman, later pointed out regarding market failure in the determination of the hours of labor. This would seem to be confirmed by Marshall's -- and his protege, Pigou's -- endorsement of the Chapman theory. Marshall's use of the term "fixed Wage Fund" is also revealing in that it directly relates the fallacy claim to the wages-fund doctrine of classical political economy. It echoed John Wilson's sentiments, twenty years earlier, about a "Unionist reading of the Wage-fund theory." This also is significant because Steward's 1865 pamphlet was grounded in an explicit repudiation of the wages-fund doctrine at a time when that doctrine remained an article of faith for respectable political economists. All this tends to show that a general reduction of the hours of labour is likely to cause a little net material loss and much moral good: that it is not adapted for treatment by a rigid cast-iron system, and that the conditions of each class of trades must be studied separately. I am now in Toronto for the History of Economics meetings. Lucky timing. The fires are continuing Chico. The American Red Cross Disaster Response Team is set up in one of the campus buildings. Arnold Schwarzenegger came to town yesterday to see how bad it was. Fires and floods are becoming commonplace. Our only hope is drilling for oil offshore and Alaska. I'm linking to a nice paper [Nicola Giocoli: Three Alternative (?) Stories on the Late 20th-Century Rise of Game Theory] asking about the reasons for the sudden boom in the use of Game Theory in economics in the eighties. His bottom line is Harsanyi's development of tools for thinking about games of incomplete information, so-called Bayesian games. But he also gives some importance to the following circumstance: The Chicago School completely dominated Antitrust policy in the eighties. I remember in Grad school in the late 70's the suffocating growth of Panglossian Industrial Organization thinking. This was the stuff that would look at any apparent example of restraint of trade - resale price maintenance, eg - and find that it was rational and efficient. Predatory pricing was irrational and could never happen; the only real entry barriers were put in place by the dead hand of the state. Laissez faire; laissez allez, in short. Economists dissatisfied with this picture - in particular, thinkers associated with Stanford's Graduate Schoool of Business such as Paul Milgrom and John Roberts - used Harsanyi's Bayesian techniques to provide rigorous counter-examples to the Chicago conventional wisdom: to show how predation might make sense, how non-state entry barriers - such as building excess capacity, might well succeed, and so on. Many things can be done for self, family, and domicile which cost nothing but time and labor; but when done, are sure to suggest one or two things more, costing money. There is time after eight hours' labor to attend an evening concert, which adds a little to the expense, but much to the enjoyment of the family. The Smiths and Jones "and everybody" are going, "and who wants to be so different from everybody else." If these are trivial considerations to intelligent minds, they are the only ones which can be brought to bear upon the masses to tempt them to bid for higher wages. The great majority of men and women must "act like other folks." "What will people think?" or "What will people say?" is the most terrible question which they can be asked. The expression "keeping up with the Jones" is commonly attributed (on the internet) to a comic strip of that name by Arthur Momand begun in 1913. But was the idea of "keeping up with the Joneses" original with Steward and his eight-hour theory? So I take a tour around the economic blogosphere. What do I find: Delong pointing to Weintraub trashing Steve Marglin's new book. Tyler Cowen's and Steve Dubner's commenters (more than a few) telling me that the Greatest Thinker of Our Time is.......AYN RAND or THOMAS SOWELL. I'm not making this up. Right. Then the Greatest Cook Of Our Time is the guy who lowers the fry basket in the McDonald's down the street. Good Grief! This is June 16th, the day recounted in Joyce's Ulysses. I named my daughter Molly after the fictional Molly Bloom. Happy Bloomsday, Molly! It’s been two weeks since I put out a challenge to proponents and practitioners of computable general equilibrium (CGE) models. As you may recall (or if your short-term memory falters, reread), I pointed out that, in light of well-known issues in general equilibrium theory, and after 30 years of experience, the time had come for those who believe in CGE to step forward with performance data. Is there any evidence that predicted CGE results hold in the real world, or that CGE methods are seen as useful in the marketplace? Or is this simply a self-perpetuating enterprise, feeding off academic and government contracts in a world where results don’t matter? In addition to its thunderous presence on EconoSpeak, my challenge was mirrored in several other venues. Thanks to the magic of Google, I was able to monitor the comments posted around the blogosphere, and here is what I got: nada. Oh, I read several lame arguments that it is in the nature or purpose of CGE that real-world performance data are impossible to come by or that they wouldn’t matter anyway, but no one had even a shred of evidence to offer. So here we go again, and I will be more explicit. Unless anyone can demonstrate otherwise, I suggest that CGE is an academic bubble whose intellectual value is grossly inflated, and which will crash to earth once the idea dawns that conjectures are no substitute for results. Those who currently buy this sort of analysis, not to mention those who make the career decision to invest years in learning its technical arcana, are throwing away their time and money. There’s no there there. Show me why I’m wrong. There is a lot I could jump on in Roger Lowenstein’s witless diatribe in today’s New York Times Sunday Magazine, but let’s keep it simple. Lowenstein, claiming to paraphrase Gary Hufbauer of the Peterson Institute (who should either sue for libelous misrepresentation or go into a different line of work), writes: “Thanks to the cheap dollar, U.S. exports are booming; trade is now the economy’s strong suit.” Now read that last clause again: “trade is now the economy’s strong suit.” Um, no. Have I mentioned that we have numbers on that? Some of you may have seen the news about the huge California wildfires. One of the biggest started just outside of Chico, but has been moving up toward Paradise, about 10 miles away. 5000 homes are at risk and much of the city has been evacuated. It is also very close to the junior college. As of this morning, the fire is only 10% contained. The expected shift in the winds will blow the fire up the canyons causing enormous damage. Part of the problem is the inadequate rainfall we have had. Maybe we could make a trade with the midwest. 35 miles an hour winds kept much of the smoke away until this morning. Visibility is now very bad. I do not know how many pack-of-cigarettes-equivalents I am getting from breathing the air. On Sunday morning, I will be on my NAFTA tour, giving a talk in Mexico City and then attending the History of Economic Society meetings in Toronto. An article in the LA Times accuses newly appointed economic policy director for Obama, Jason Furman, of having supported privatizing social security. There are a number of issues on which most progressive economists would differ with Furman, but this claim that he supported privatizing social security is simply an outright lie as pointed out on both brad delong and ecnomists view. Instead, he was one of the firmest and most effective critics of the Bush plan to gut social security. One place he did that was from a perch as a co-blogger on the predecessor to this blog, the much-missed Maxspeak, formerly run by Max Sawicky. During the period of the battle over the Bush attack on social security, Dean Baker was also a co-blogger there, and it was command central for those opposing the Bush plan (with people like Bruce Webb and I also making a lot of noise there). It was from Maxspeak as transmitted through Brad Delong to Paul Krugman, the NY Times, and then the broader media that the most effective anti-Bush-plan arguments were promulgated, transmitted, and then brought to bear. Whatever one thinks of his views on Wal-Mart and other matters, Jason Furman played an important role in this successful effort to preserve social security as it is. Obama is taking flack for his appointment of Jim Johnson, former head of FNMA and recipient of a loan from Countrywide, to vet VP candidates. Fine, this is a mistake. The media howl, especially the cable news. But where was the howling several weeks back when it emerged that the egregious Phil Gramm was formulating McCain's policy proposal for handling the sub-prime mess - the one that would do nothing for home-owners- while still working as a lobbyist for USB, whose portfolio is full of sub-prime junk. There is strong circumstantial evidence for my contention that the shorter work time fallacy meme in economics textbooks was dictated by the propaganda bureau of the National Association of Manufacturers. I will be detailing that documentation in a future post or posts. Meanwhile, I've discovered that "most of NAM's pre-1935 records were destroyed" before the Association's archives were sent to the Hagley Museum and Library where they now reside. It is a commonplace of international economics that virtually all economies obey the Marshall-Lerner conditions, which must be met if a change in the exchange rate is to have the “proper” effect on net exports. It’s just possible, however, that this no longer applies to the US. When the dollar falls, US exports rise and non-oil imports fall by enough to otherwise satisfy M-L. But much of the rise in oil prices, as experienced in the US, is also attributable to the decline of the dollar, and our demand for brown goo is (so far) highly inelastic. As reported in Brad Setser’s invaluable blog, this explains why the US trade deficit increased in April despite deteriorating domestic demand. So: has the US left the predictable world of M-L? It depends. How much of the price spike in petroleum is traceable to the fading dollar? How do we parcel out the role of declining domestic demand from that of dollar depreciation on the trade balance? I’m too involved in other things to figure this out, so I place it in your laps, estimable readers. BusinessWeek published an intriguing article about Japanese automakers boosting domestic investment to expand production in Japan, even though the Japanese market is declining. The Japanese plants will have a competitive edge because they are more flexible and have fewer defects. German companies are also ramping up Japanese production, presumably for similar reasons. What US companies are following a similar strategy rather than adopting a race-to-be-bottom approach? Rowley, Ian. 2008. "Facing an Auto Slump, Japan Lifts Capacity: Carmakers Are Expanding at Home, Where Nimble, High-Tech Plants Offer More Flexibility." Business Week (29 May): p. 64. "In the midst of a dramatic earnings slump, Toyota, Nissan, and Honda are ramping up production fast. Not in the U.S., their most profitable market, but back in Japan, where domestic auto sales just hit a 25-year low. Every major Japanese automaker is building plants at home or adding capacity to existing ones. A Toyota subsidiary is constructing a 120,000-car plant in Miyagi, north of Tokyo. It's Toyota's first such plant in Japan since 1993. Nissan, which not so long ago was slashing production in the country, is expanding capacity by 22% at its Kyushu factory. Honda is spending $1.5 billion on a new factory and engine plant in Saitama, just outside Tokyo. "The time has come for our Japan operations to once again take the initiative," Honda President Takeo Fukui told reporters on May 21." "Why all the outlays? After all, Japan's carmakers have long had a policy of opening plants in overseas markets to avoid import duties and to hedge against currency gyrations. Japan remains an expensive place to make cars, with wages 10 times higher than in China. A shrinking population is causing labor shortages. The yen's recent 15% surge against the dollar makes Japan-made cars even pricier. Throw in contracting domestic sales, and the moves seem to defy business logic." "One explanation is the flexibility that the investment brings. Japan's high-tech plants excel at switching production from one model to another. That's especially useful when auto demand is sinking or flat in mature markets but surging in the Middle East, Russia, China, and India. Nissan's Kyushu plant, for example, exports to 160 markets and produces eight different models on a single production line." "Anxiety over quality is another factor in the increase of production back home. In recent years, Toyota has had to issue numerous recalls, while Nissan's Canton (Miss.) plant became notorious for its defects during a production speedup. Executives are loath to admit that one plant is better than another, but Japanese makers' domestic factories score higher on quality than equivalent plants overseas." "Japanese engineers and workers, while more expensive than their counterparts in developing markets, are still a good deal. One reason is that Japan's wage levels, after barely rising in a decade, are not as high as they once were relative to other developed countries. According to consultant AlixPartners, Japanese industrial workers in 2006 made around $22 an hour, just two-thirds the level in Germany. Moreover, it's still rare in Japan for workers to switch from one automaker to another, so a well-trained, seasoned workforce is a given. "It's not so expensive in Japan, and when you consider the quality, motivation, and diligence with which people work, the value-for-money is unbeatable," says Markus Schädlich, president of Karmann Japan. In December, Karmann, a German company that makes convertibles under contract for Audi, Mercedes, and Nissan, will begin production at a factory in Japan." "The notion of mother plants, which test new technologies that later filter out to plants worldwide, remains strong. Fukui predicts Honda's Saitama plant will set an example for its plants globally. Labor productivity is expected to be 20% higher than in existing plants, thanks to greater automation and advances in welding and painting. Honda aims to cut the amount of energy used to produce each car by more than 30%. Honda and its Japanese rivals are not abandoning their plan to make cars around the world. But they are strengthening Japan's role as the essential benchmark." In "The Gospel of Consumption," Jeffrey Kaplan channels the Sandwichman, arguing that if we want to save the earth we can start by sharing the work and the wealth. 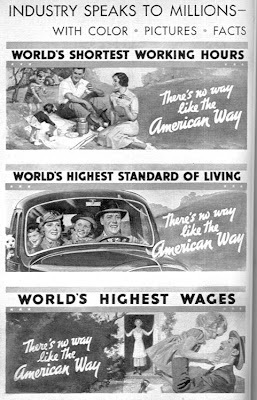 Kaplan borrows liberally from Ben Hunnicutt's books (Kellogg's Six Hour Day and Work Without End: Abandoning Shorter Hours for the Right to Work) and about the triumph of consumer culture over working less and also features a discussion of the anti-New Deal "American Way" publicity campaign conducted by the National Association of Manufacturers. Co-incidentally, in my own research on the NAM, I kept stumbling across an article by John Tagg, titled "Melancholy Realism: Walker Evans's Resistance to Meaning". This morning I discovered that I had access to an online version of the article. Tagg frames his discussion of the NAM American Way campaign with a discussion of the famous LIFE magazine photo by Margaret Bourke-White showing a breadline of African-American flood refugees in front of one of the 60,000 American Way billboards, this one proclaiming the "world's highest standard of living." Later in the article, he goes on to contrast Bourke-White's rhetorical clarity with the melancholic "unreadability" of Walker Evans's photography. In the process, Tagg touches on several of the images that are dear to the Sandwichman's thought. One of those image in particular binds Kaplan's discussion of the Gospel of Consumption much tighter to the shorter work time movement. It is a leaflet promoting the American Way billboards, which included one proudly proclaiming "World's Shortest Working Hours!" This from an organization that cranked out a steady stream of literature denouncing the "disastrous effects" and "real problem" of the "dangerous fallacy" of shorter working time. I guess it just goes to show, there's no way like the American Way! I just got around to reading an important paper, “Current Account Patterns and National Real Estate Markets” by Joshua Aizenman and Yothin Jinjarak. Looking at a sample of developing and developed countries over the period 1990-2005, they find the current account deficits are the main explanatory factor for real estate appreciation. (It would be clumsier but more accurate to say real real estate appreciation, since prices are deflated by the GDP deflator.) Their work is careful, and their empirical model accounts for 70% of the variation they study. Running a current account deficit results in higher real estate values, especially in countries with more developed credit markets, but this effect is somewhat reduced where there is less country risk. The authors control for the appropriate confounders, such as interest rates. In fact, external balances play a bigger role than interest rates in real estate markets, a surprising result. This is consistent with the position that I’ve taken on this blog, that the inflow of funds to finance our current account deficit renders the US susceptible to asset price bubbles, and that the runup in housing values was just one (but a very big) manifestation of this. If I’m right, and if the housing channel is being shut down, some other bubble is indicated. Problem: McCain will define himself as tough and resolute in foreign policy, committed to defending us vulnerable Americans from the wolves near and far. Implicitly, and perhaps explicitly, this will paint Obama as weak, confused and incapable of assuring our safety. This is a matter of images, not reality, of course, but that’s how elections work. Analysis: Obama’s counter-image is that he will restore America to respect around the world, rebuilding alliances and replacing bellicosity with diplomacy. Against this backdrop, McCain’s foreign policy would take on the hue of Bush, continued. One challenge Obama faces is how to convey this impression visually and viscerally. Fear and retaliation are easier to package than cooperation. Solution: Obama should undertake a foreign campaign trip this summer, publicly appealing to American voters overseas, including both civilians and military expats. He could explain that America is itself now globalized, with its citizens scattered across the continents. His trip could then be portrayed as a campaign swing like any other. But holding enthusiastic mass rallies across Europe and Asia especially, Obama could deliver exactly the we-are-the-world images that would give emotional resonance to his political stance. Honestly, I don’t see what McCain could do to diminish the power of this strategy. ... Lost in this hubbub, however, is a bigger idea that Mr. McCain and his economic team have put forward: a cut in the corporate tax rate, to 25 percent from 35 percent. It is perhaps the best simple recipe for promoting long-run growth in American living standards. Cutting corporate taxes is not the kind of idea that normally pops up in presidential campaigns. After all, voters aren't corporations. Why promise goodies for those who can't put you in office? I don't believe that the corporate tax really affects the return on corporate equities, except in very special situations and in the short run. The fact is that those who buy US corporate equities can always buy them in places where corporate income is not taxed -- or can buy the stocks of US companies that don't pay any corporate taxes at all. That bids up the return on the taxed assets, so that after-tax rates of return are equalized. The main case where I can see the corporate tax actually lowering returns on equity would be that where the companies reap large raw-material scarcity rents. But those companies often (usually) get "depletion allowances" and the like, more than compensating them for their loss. As discussed below, I do think the corporate tax affects returns on stock prices in the short run. In other words, in the long haul (about a year or so) I see the corporate income tax as mostly being reflected in higher consumer prices and/or lower wages. Since that tax isn't very large these days, I don't see this as being very important. Initially stock prices would rise, but the arbitrage I describe in my first paragraph above would cause this to end in the long haul (even a period as short as a week). Then the corporations and the stockholders would hunger for a new tax cut to get another transitory boost in returns. This seeking of a short-term fix is an important reason why the corporate tax keeps on being lowered (even though in the longer haul, the owners don't really pay the tax). It's a bit like a drug addiction: the stockholders want transitory pleasure. Because it doesn't last, they want it again & again. but the results would not end there. A stronger stock market would lead to more capital investment. This connection between stock prices and corporate investment is very weak and likely non-existent, as Doug Henwood and others have pointed out. It's amazing that Mankiw so blithely assumes that this connection is automatic. It is especially weak given the way in which the SM fluctuates so wildly and the way in which arbitrage would get rid of the extra return pretty quickly. More investment would lead to greater productivity. This assumes that the investment is real, rather than purely financial, like buying up other companies. It assumes that it's in actually producing some commodity rather than in marketing and the like. It assumes that the investment is done inside the US. Greater productivity would lead to higher wages for workers and lower prices for customers. Greater productivity leads to higher wages? since when? it hasn't worked that way for about 30 years. Real wages of nonsupervisory employees have generally stagnated since the early 1980s, even though labor productivity has soared (though not as much as it soared in earlier decades). Most of the productivity gains have gone to stock-owners and CEOs. For Mankiw's story to work, the one-sided class war would have to end. He isn't calling for an end of the war. Instead, he has instead tried to provide ideological ammunition to the other side. Consumer prices might fall (assuming US productivity rises) but only relative to existing inflation. And given all of the weak links in the chain above, that wouldn't be a big thing. Populist critics [who shall be slammed but unnamed, of course] deride this train of logic as "trickle-down economics." But it is more accurate to call it textbook economics. Students in introductory economics courses learn that the burden of a tax does not necessarily stay where the Congress chooses to put it. That lesson is especially relevant when thinking about the corporate tax. has Mankiw ever contemplated why "trickle down" has such a bad rep? maybe because it hasn't worked within recent memory?? (Maybe it worked during the 1960s, but the US political economy was completely different from nowadays.) I'll ignore the cheap rhetoric of the rest of this paragraph. In a 2006 study, the economist William C. Randolph of the Congressional Budget Office estimated who wins and who loses from this tax. He concluded that "domestic labor bears slightly more than 70 percent of the burden." A similar result was found in a recent Oxford University study by Wiji Arulampalam, Michael P. Devereux and Giorgia Maffini. After examining data on more than 50,000 companies in nine European countries, they concluded that "a substantial part of the corporation income tax is passed on to the labor force in the form of lower wages," adding that "in the long-run a $1 increase in the tax bill tends to reduce real wages at the median by 92 cents." Mankiw ignores this context in order to propose a corporate tax be cut to draw investment in from other countries. But that simply encourages the creep toward the bottom, along with lowering wages and paring government regulations. Despite these findings, a corporate tax cut as a way to help workers may strike some people as needlessly indirect. Why not just pass an income tax cut aimed squarely at working families, as Senator Barack Obama proposes? The answer is that while most taxes distort incentives and shrink the economic pie, they do not do so equally. Compared with other ways of funding the government, the corporate tax is particularly hard on economic growth. A C.B.O. report in 2005 concluded that the "distortions that the corporate income tax induces are large compared with the revenues that the tax generates." Reducing these distortions would lead to better-paying jobs. I'd like to see the assumptions behind that report. Mankiw also seems to be saying that Obama's proposal would "distort incentives and shrink the economic pie." How would that happen, Greg? It would promote aggregate demand (all else constant) which would raise the size of the economic pie that's realized as actual sales, something that seems needed in the midst of a recession. I don't know the details of Obama's plan, but I'd like to hear more about how it would undermine workers' incentive to work. In hard times, facing bills rising relative to income, most people want to work as much as possible, trying to moonlight with two or even three jobs if they can. The problem is not the incentive to work but the availability of jobs. Of course, a corporate tax cut would affect the federal budget. And any change in tax policy has to be made against a background of a looming fiscal crisis, which threatens to unfold as baby boomers retire and start collecting Social Security and Medicare. There must be a typo here: Mankiw must be smart enough to know that there is no "looming fiscal crisis" associated with Social Security, so it's wrong to unite it with Medicare in a single package. In 2007, corporate taxes brought in $370 billion, representing 14 percent of federal revenue. Cutting the rate to 25 percent would seem to cost the Treasury about $100 billion a year. Part of that revenue loss, however, would be recouped through other taxes. To the extent that shareholders would benefit, they would pay higher taxes on dividends, capital gains and withdrawals from their retirement accounts. this won't happen if taxes are cut again on dividends, capital gains, and IRA withdrawals, as Mankiw would likely advocate. To the extent that workers would benefit, they would pay higher payroll and income taxes. Increased economic growth would tend to raise tax revenue from all sources. SOME economists think that these effects are strong enough to make a corporate rate cut self-financing. A recent study by Alex Brill and Kevin A. Hassett of the American Enterprise Institute [a very objective source, natch], looking at countries in the Organization for Economic Cooperation and Development, supports exactly that conclusion. But even if that turns out to be too optimistic, both theory and evidence make it reasonable to expect a significant discount from the sticker price. In the end, the net budgetary cost of the tax cut might be, say, $50 billion a year. Great, a totally worthless guesstimate! Senator McCain wants to fill that hole in the budget by restraining spending. If he can stop bloated legislation like the recent $300 billion farm bill from becoming law, more power to him. How about ending the $3 Trillion war before it gets even more expensive? how about avoiding the renewal of the Bush tax cut for his rich friends? even better, how about a Bill Clinton-type tax hike for them? These guys haven't been running the economy very well of late. Why reward them for poor behavior? But in case that quest proves quixotic, I have a back-up plan for him: increase the gasoline tax. With Americans consuming about 140 billion gallons of gasoline a year, a gas-tax increase of about 40 cents a gallon could fund a corporate rate cut, fostering economic growth and reducing a variety of driving-related problems. Indeed, if we increased the tax on gasoline to the level that many experts consider optimal, we could raise enough revenue to eliminate the corporate income tax. And the price at the pump would still be far lower in the United States than in much of Europe. I'm all in favor of raising the gas-tax. I notice, however, that Mankiw elided the usual addition to gas-tax hikes, i.e., a tax cut or credit for those at the bottom of the income distribution. That would hurt his ability to earn thousands of dollars doing public speaking for business groups, of course. I can't laugh. He's too stupid. Yesterday, I had a very nice radio interview with Alan Ruff on WORT, a community radio station in Madison, Wisconsin. I should probably let sleeping dogs lie on the day Hillary is (finally) graciously conceding and supporting Obama for president. However, I am bothered by the ongoing whining by embittered Hillary supporters who declare that they are "not willing to shake hands" and claim that Hillary lost due to sexism in the media and the public at large, as well as some blog commentaries. I do think Hillary faced sexism and much of the liberal media supported Obama over her, with Matthews and Shuster on MSNBC making unacceptable remarks. It is also true that sexist remarks have been made in the blogosphere about Hillary. However, I think that Obama beat her because of people being for him, with those against her more due to her link with Bill Clinton and the scandals of his administration than her gender. Some may say blaming her for her husband's problems is sexist, but I do not buy that as he would certainly have been around big time if she had become president, and she began with high negatives (over 40%) widely reported to be due mostly to that connection. I happen to know a couple of politically independent (white) women here in Harrisonburg who supported nobody, but were very anti-Hillary on those grounds. More fundamentally, those making this sexism argument somehow do not notice that Obama faced a racism hurdle. It looks to me that the racism against Obama was a much more serious electoral hurdle than the sexism against Hillary. For one thing, there are more women than men, and a lot more white women than African-Americans, and we know that Hillary got lots of votes from women supporting her, even if there were some men voting against her on sexist grounds. I see several things here that show it. One is the behavior of the candidates themselves. The only thing I am aware of that Obama was accused of being sexist for doing was holding a chair for Hillary during a debate. She, however, bragged late in the campaign of her appeal to "white voters." Obama supporters in Pennsylvania were beaten up by people calling them "N..... lovers," I am unaware of anything comparable happening to Hillary supporters. Finally, there is a bottom line, the voting behavior of two groups, especially in the later stages of the campaign: white men and African-American women. White men increasingly supported Hillary over Obama; African American women increasingly went the other way. That last one is the real key, as they are the group that experiences both sexism and racism. Their support for Obama pretty much says which has been more salient in US politics recently, a country that fought its bloodiest war over the slavery of African-descended people. Patrick Coburn of the Independent has reported that the US is threatening to seize $20 billion of Iraq reserves held at the New York Fed if the Iraqi government does not agree to a security agreement granting the US 50 military bases and freedom of action for the US military and legal immunity for both the US military and private US contracters in Iraq. US Ambassador Ryan Crocker has said the US is not demanding permanent bases, but has not denied the other parts and admits that a tough negotiation is going on. Indeed, it appears that pretty much every political leader in Iraq opposes it, including Abdel-aziz al Hakim, leader of the largest party (SIIC) and part of the government, along with the most influential cleric, Grand Ayatollah Ali Sistani, and even Premier al Maliki's party, al-Da'wa, has split over it according to Juan Cole today. For Coburn's story see "US issues threat to Iraq's $50bn foreign reserves in military deal". "Mr. Sargent has been getting out letters, collecting data, making addresses, and holding debates with eminent representatives of the other side of the question, making addresses in our colleges and universities, and he has attracted a great deal of favorable attention from our seats of learning in this country. He is teaching the teachers. He is teaching the professors and college presidents." That is how National Association of Manufacturers President John Edgerton introduced Noel Sargent, manager of the Open Shop Publicity Bureau (subsequently renamed the Industrial Relations Department) at the NAM's 1923 convention. Prior to working for the Association, Sargent was a professor of economics at the University of Minnesota. How accurate was Edgerton's boast, "he is teaching the professors and college presidents," and what conceivable relevance could it have for economics in the 21st century? Among the contributors to NAM "educational literature" were Harvard University President Charles W. Eliot and University of Chicago economics professor, founder of the Journal of Political Economy, J. Laurence Laughlin. Other conspicuous advocates of the NAM open shop policy included Chancellor James Roscoe Day of Syracuse University, President George B. Cutten of Colgate University and Dean Robertson of New York University. In 1922, the Open Shop Publicity Bureau "supplied 1,500 colleges and university teachers of economics and sociology with material.... Practically all of the college and university teachers of sociology, government, and economics receive our publications." Sending materials to university professors provides no guarantee they will read them or pass on the message to their students. The substantial quantity of non-NAM publication by economists echoing the NAM talking points (in defiance of conclusive evidence contradicting NAM assertions) is strong circumstantial evidence that economics professors did read and adopt the NAM party line. Also, the well-documented pressure tactics of the Association in its dealings with the press and Congress offer a clue to how the Open Shop Publicity Bureau probably would have added "legs" (and a strong arm) to its message. In its relations with the press, the Association sent out materials to newspapers, monitored the take-up of these stories by the papers, rewarded (with advertising revenue) those newspapers who towed the line and punished those who didn't through blacklists and boycotts. It made no secret of those activities; rather it extolled them as the organization's sacred and patriotic duty to uphold the US Constitution and the Ten Commandments of the Old Testament. The hyperbole is not Sandwichman's but President Edgerton's in a 1920 address to the Tennessee Manufacturers Association. "When the people of this enlightened country surrender to the absurdity of the argument for the so-called closed shop and accept it as an established institution, they will owe it to the devil to repudiate the Decalogue and repeal the Constitution of the United States." On the other hand, its dealings with Congress were handled somewhat more discreetly. It took a Congressional investigation in 1913 to expose the machinations of the "invisible government" that the NAM orchestrated. 1. That the NAM actually carried out the intentions with respect to college teaching of economics that it publically proclaimed. "We must point out to the people that all this legislation that is going on affects them; shorter hours increases the cost of living, raises taxes, creates a condition for them that is really worse than it is for the manufacturers. We owe it to them. We must do it. That is the important thing for this organization to do." 2. That the NAM used strategies toward that end consistent with the strategies it employed in its other endeavors. 3. That in practice, the NAM strategies would have been virtually identical to those documented by FCC investigation in the case of the Missouri and Illinois committees on Public Utilities Education. 4. That the publication of hundreds of economics textbooks and other publications echoing the NAM claims would be more difficult to explain in the absence of a NAM campaign of carrots and sticks. I was just invited to deliver a paper in Mexico in a few days. I have to send it off even earlier, but what I have is a very rushed effort, thrown together in two mornings. Any quick pointers would be appreciated. Thanks in advance. Property rights attract private capital and, with government space programs stagnating, a lunar land rush may be just what we need to get things going again. I'll take a nice parcel near one of the lunar poles, please, with a peak high enough to get year-round sunlight and some crater bottoms deep enough to hold ice. Reynolds, Glenn Harlan. 2008. "Who Owns the Moon? The Case for Lunar Property Rights." Popular Mechanics (June). My premise is that the US Presidency is 90% symbolism and 10% muddle. As far as I know, Barack Obama has taken no major policy positions addressing the hours of work. But in the realm of symbolism, Obama's nomination throws open a door that has been tightly shut for 150 years: American exceptionalism. One persuasive answer to the old question of why no formidable socialist or labor political party ever emerged in the United States has to do with the legacy of slavery and the faux "work ethic" ideology of white working men. Historically, rather than viewing themselves as antagonistic to the robber barons and captains of industry, a large portion of white working class men have derived their identities from being "not slaves". "I work hard because I believe in hard work. It is my choice to work hard, that is how I know I'm not a slave. What is hard work? Working hard!" The white work ethic hints at the same confused and ashamed closet that homophobia dwells in (this is not to indict the work ethic per se, but an exclusivist version of it peculiar to white males). Whiteness, itself, is simply a negative residual of being not black. There is no such thing as white culture. There's Italian cooking, English theatre, Irish pub music and Dutch painting but no white culture. Coincidentally, there's no such thing as black culture, either. There is, however, a parody and representation of plantation entertainment that generated the stereotype of black culture -- the black-face minstrel show of the 19th century. The really odd thing about the minstrel show is that the slave entertainments the minstrel shows parodied often themselves already performed parodies of the plantation masters' peculiar folk ways. So the Northern white man's fantastic image of Southern black slave culture was itself already a parody of a parody. Hegel once said something about great events and persons in history happening, as it were, twice. Marx added that the duplication appeared the first time as tragedy, the second as farce. The great tragedy of American exceptionalism is that it has been farce all the way down. It should go without saying that slave labor was a form of labor. Moreover, American slavery was a variety of capitalism. The New York merchant bank of Brown Bros. & Co. -- subsequently Brown Bros. Harriman, employer of Bush Grampa Prescott -- owed its fortune to financing Southern plantations in their purchase of slaves and trade in cotton. One of the delicious ironies of the work-ethic ideology is that it ascribes financial success to individual effort and poverty to sloth. Thus, it was presumably George and John Brown who planted and picked all that cotton while their slaves were too busy shuckin', jivin' and eatin' watermelon to do a lick of work. And yes, I know that Barack Obama is not descended from slaves but false stereotypes don't bother with such distinctions. The miracle of the African-American experience under slavery is that people retained their humanity -- even their sense of humor -- through harsh, inhuman, conditions. I wonder if perhaps the initial impulse of the black-face minstrel show wasn't more a celebration of this triumph than a disparagement. Somewhere along the line, though, audiences forgot they were watching burlesque and starting mistaking it for documentary. It is inevitable in the coming election season that a lot of creepy-crawlies are going to come out from under their rocks. On the one hand, that is deplorable. On the other hand, though, airing the potency and taken-for-grantedness of the tradition of American racism may provide just the innoculation needed to move on to other questions that have been perpetually sidelined by the racist agenda. So what does that have to do with shorter working time? It's a complicated argument but the starting point is in the anti-slavery origins of Ira Steward and the eight-hour movement in the 19th century. Steward's arguments for the eight-hour day derived initially from his analysis of slavery. More recently, David Roediger has written histories both of the movement for shorter working time, Our Own Time as well as of the role of racism in American exceptionalism, The Wages of Whiteness. Rather than recapitulate Roediger's analysis or Steward's, I will simply end this note with the hope that the symbolism of an Obama presidency -- even its mere possibility -- will proclaim America's emancipation from the ideological and political chains of racism. I am happy to announce that my new local assemblyman -- the winner of the Republican primary is certain to win in November -- made as his overriding issue the importance of protecting our borders. I assume that he will be overseeing the erection of a major wall surrounding his district, which encompasses parts of several counties. At last I am free from the threat of an invasion by a fleet of taco trucks. Poison? These are exactly what we need. Rather than sensing the opportunity to build a coalition with conservatives like Corker who rightly understand that we need a strong cap with minimal government meddling, Democrats can think only of showering business with giveaways. Of course, to have exemptions, offsets, freebie allocations and other goodies to pass out, the politicians have to push a plan riddled with loopholes. The Democratic Party, as it now functions, is too wedded to narrow business interests, a proclivity it fine-tuned during the Clinton years, to grapple with a genuine public imperative like preserving a liveable planet. That’s what I would call an inconvenient truth. Is Supporting Preserving Social Security As Is While Advocating Combatting Global Warming Hypocritical Confusion? This is the charge made by Arnold Kling at econlog and in more detail by Andrew Biggs. Biggs is former Bush hit man on social security, and he and Kling both see those who doubt that social security is "in crisis" and those who doubt that global warming "is a problem" as being somehow similar, namely confused, and if one is supporting one and not the other, not just confused, then (implicitly, although neither used this word) hypocritical. I have commented on Biggs's blog that I think it is not unreasonable to support social security as is while supporting doing something about global warming. He claims that changes to social security are "permanent" (as are changes to global climate), and of course supports the usual pessimistic forecasts. I argue that on social security that a) the pessimistic forecasts have not done too well so far, and b) social security can be changed at any time if indeed things go bad. However, with global warming, the downside is much worse and the lead times are much longer. Also, they do not have the same probability distributions, with social security essentially more of a normal distribution, but with global warming, as Martin Weitzman has pointed out (and similar to financial market returns), there are these non-normal "fat tails," too high a chance of extreme events due to nonlinearities and positive feedbacks in the system, with the geological record supporting the idea that very rapid temperature change has happened in the past. So, we must worry about those non-trivial catastrophic outcome possibilities, much more serious than possible underfunding of the US social security system. 1. Cap carbon as upstream as possible, at its source rather than its use. Any entity bringing coal into the economy, by mining or importing it, should have to have a permit. Don’t put the government into the position of deciding who should be given a special dispensation to burn it. 3. Don’t allow offsets. Measurement of how much carbon the offsets really offset will always be fuzzy, and wriggle room will be sold to the highest bidder. 4. Tax imports that aren’t produced under a carbon cap. If other countries delay in setting up their own policies, adopt a transparent tariff schedule based on embodied carbon content, ideally under the auspices of an international, disinterested body. This will address much of the competitiveness fear, while producers gear up for long-term advantage based on innovative responses to emissions caps that will eventually be adopted worldwide. 5. Adopt sector-specific technology subsidies and mandates. Don’t fall into the either/or trap: carbon capping provides the architecture, but there is still a need for policies that mobilize a coordinated response in dimensions like research, infrastructure and breaking down the institutional barriers to innovation. Fuel and appliance efficiency standards, large-scale public investments in new technology, installing a higher-tech electrical grid, mass transit—these are the kinds of measures that will make it possible for us to make a reasonable life for ourselves under an ever tightening carbon cap. One of my Work Less Party peeps, Conrad has made a short film you should all see. "What if we used our gains in productivity to slow down ? We could work less and produce less. It would also mean consuming less. "If you like the film please forward this website to a world that desperately needs some slowing down." "Tom McGee's business is surging faster than the price of gasoline. That's because PMP Corp. is one of the few places in the U.S. that gas stations can turn to when they need old-style gas pumps adapted to register prices over $4 a gallon. The mechanical dials on many vintage pumps can't register prices over $3.99 a gallon or ring up single sales north of $99.99." "Many small-town stations, especially in remote, rural areas, can't afford to buy new pumps, which can cost as much as $10,000 each. PMP's retrofits are between $600 and $800." "PMP has a 20-week backlog, up from three days in March, and Mr. McGee's 70 workers are doing maximum overtime. He has hired more temporary workers, but it is slow getting them up to speed. The labor-intensive work involves tasks such as printing new numbers on the spinning wheels that form the core of the pricing mechanisms. His suppliers are running out of crucial parts." "The work is also done by pump manufacturers like Gilbarco Veeder-Root, part of industrial conglomerate Danaher Corp., of Washington, D.C. An estimated 8,500 of the nation's 170,000 gas stations have the old-style pumps." Aeppel, Timothy. "For PMP, $4 Gas Is Great for Business: Firm Helps Service Stations Adapt Old Pumps for Higher Prices." Wall Street Journal (2 May). I’m currently working with Sightline Institute in Seattle, monitoring the economic analysis phase of the Western Climate Initiative. WCI, which consists of seven US states and three Canadian provinces, is cooking up a common carbon emissions plan, and a consulting firm has been brought onboard to help clarify the economic implications of different policy alternatives. There are many issues specific to this project I may return to later, but for now I’d like to put the spotlight on the methodology WCI will be relying on, CGE modeling. I think these models are so dubious theoretically and unreliable in practice that there is no case for using them. In particular, I am issuing a challenge to their defenders: if no one can answer it, the case is closed. On a theoretical level, it is surprising that CGE modeling has become such a vibrant industry, since its underpinnings in general equilibrium theory have been systematically undermined over the past several decades. (1) CGE models use the technique of representative agents—vast numbers of households and firms are treated as if they were a single decision-making entity—when we now know that multiple agents cannot be modeled as if they were just one. (2) In particular, the Debreu-Sonnenschein-Mantel result demonstrates that full knowledge of all supply and demand relationships in an economy is not sufficient to predict the equilibrium the economy will arrive at when it is not there yet. (3) The behavioral assumptions of these models, typically resting on utility maximization or simple modifications of it, have been empirically falsified. (4) Production and utility functions are routinely chosen for their convexity properties, despite the widespread recognition that nonconvexities (that yield multiple equilibria) are rife. In short, if theory should inform practice, we shouldn’t be doing CGE. Now for the challenge. As far as I know, there has never been a rigorous ex post evaluation of CGE models in practice, one that compares predicted to actual outcomes. Based on performance, is there any evidence that such models add value—that their predictions are any better than those derived from macro or sector-specific models, or even a random walk? Also, are CGE models employed by any private sector players who bet real money on the results, or is it only in academia and the public sector that CGE modeling is taken seriously? My challenge is for those who think there is anything to CGE to come up with evidence that their forecasts add value—either careful retrospective analysis, market applications or both. If not, after more than three decades of experience to go on, why shouldn’t we draw the conclusion that this is a self-perpetuating enterprise promulgated by specialists who sell not an improved ability to make forecasts, but a patina of high-tech respectability for agencies with no stake in whether their policies will actually perform? Ronald Findlay and Kevin O'Rourke published a fascinating book, entitled Power and Plenty: Trade, War, and the World Economy in the Second Millennium, which comes out in support of the historical policies of mercantilism. To my knowledge, neither author has any hint of leftist sympathies. Have I missed something? 116: Jean-Claude Ellena perfumer for Hermes: "It's very important to understand that the price of perfumes is not the price of their materials. You pay for the creativity .... That has value as well, a value that I put into the perfume. This Marxist idea that the price of a thing is the price of its materials is false." Burr, Chandler. 2008. The Perfect Scent: A Year Inside the Perfume Industry in Paris and New York (New York: Henry Holt). Brenda Rosser asked me to elaborate on the concerted campaign lurking behind the textbook lore of lumpoflabor. This will be a bit messy because it relies on secondary sources and some conjecture. There is, however, one recent and scrupulously documented historical study that corroborates the overall thesis, if not the specific conjecture. The story commences at the beginning of the 20th century as major strikes by machinists and anthracite coal miners alarmed business owners about the growing power of unions. Local and national business organizations, such as the National Metal Trades Association, the Dayton, Ohio, Employers Association, Minneapolis Citizens' Alliance and the Associated Employers of Indianapolis launched aggressive anti-union "open shop" campaigns. Then in 1903, the National Association of Manufacturers, under its new president, David M. Parry, launched its own violent strike-breaking drive and sought to co-ordinate local groups through closely affiliated Citizens' Industrial Association of America and, later, National Committee for Industrial Defense. The story of the anti-union open shop movement is ably told in William Millikan's A Union Against Unions. Millikan's study focuses on Minneapolis with some reference to national events. The open shop drive was analyzed in the 1940s by Robert A. Brady in his Business as a System of Power. There's also a brief account of the "Organized Revolt of Employers" in the first chapter of Sidney Fine's Without Blare of Trumpets. The NAM became extremely "influential" in the years before World War I, to the extent that it was known as the "invisible government" after a scandal came to light in 1913 about their methods and the extent of their political influence. One of the key strategies of the various employers' organizations was conducting propaganda campaigns. These campaigns were comprehensive. They included comic strips, movies, lectures, magazines, newspaper editorials, pamphlets, orchestrated letter and telegram campaigns, etc..
And textbooks. The case for the NAM and its allies direct involvement in censuring some economics textbooks and promoting others is largely circumstantial and partly conjecture at this point. There is one celebrated case of a NAM campaign against a high school social studies textbook by Harold Rugg. There is also the documented incident of the Illinois and Missouri committees on Public Utilities Information in the 1920s conducting sweeping textbook reviews and exerting pressure on educational authorities, publishers and authors. Those activities were investigated by the Federal Trade Commission in 1928 and reported in The Propaganda Menace by Frederick Lumley. The NAM published material clearly aimed at the college market, such as the Open Shop Encyclopedia. It maintained an Open Shop Department, subsequently renamed Industrial Relations Department, headed by a former economics professor, Noel Sargent. The express purpose of that department was "educating the public". It is hard to imagine why or how they could have refrained from blessing some economics textbooks (say by guaranteeing advance purchases) and condemning others. It is not as if such interventions would have encountered a hostile or even indifferent reception. American universities in the early decades of the 20th century were notoriously reactionary and elitist institutions. See Thorstein Veblen's The Higher Learning in America and Upton Sinclair's The Goose Step for a sense of the general climate. The great majority of university trustees were businessmen or allied professionals. Students generally came from the upper middle classes and went on to become businessmen or professionals. College men were often recruited to work as strikebreakers and did so with enthusiasm. Strikebreaking was not something the collegians did out of desperation for the money -- it was a cause they believed in. So the case of NAM influence on college economics textbooks is a bit of a bear-shits-in-the-woods story. It would be difficult to imagine otherwise. As for the content influenced, I have to fall back on the observation that the shorter workday philosophy was the backbone of American Federation of Labor unionism and its expansion in the last two decades of the 19th century and the first two decades of the 20th. Discrediting the unions' case for a shorter working day would have been a strategic priority. Furthermore, since union arguments were out of step with the prevailing academic economic dogma of the day (which was still inherently classicist Say's Law, laissez-faire fundamentalism), it wouldn't have been such a hard sell. In fact, the Steward/Gunton argument for the shorter working day was probably not all that well understood by union members and spokesmen, either. In some respects, it embodied a kind of ahead-of-itself Keynesianism for which there didn't yet exist a comprehensive theoretical argument. So it took some leaps of imagination. I happen to think those leaps were and are fairly plausible and, at any rate, totally unrelated to any "fixed amount of work" or anti-technology assumption. PS -- following up on my earlier comment and YouNotSneaky's incredulity about the absence of "price-fixing" in the lump-of-labor textbooks of the 1920s, 30s and 40s: the Public Utilities Information committees specifically targeted "books favoring municipal ownership, mentioning the lack of competition with monopolies, or political corruption of corporations". Is the Pope Catholic?